The El Dorado Hills Chamber of Commerce provides ribbon cutting ceremonies for member’s grand openings. A ceremony may also be planned for business’ expansion, relocation, major anniversary, ground breaking, or renovation. When considering a ribbon cutting, contact the Chamber at 916-933-1335 to schedule. Please allow enough lead time (4-5 weeks is suggested) for promotion and to send invitations. The Chamber offers a bulk mail stamp/indicia for members use. The Chamber is available to assist with your ribbon cutting on the third or fourth Wednesday of the month between 5:30pm and 6:30pm. The Chamber does not host ribbon cuttings on weekends. Promotion should be started well ahead of the event. The way to achieve good attendance is to spread the word and advertise (e.g., local papers, magazines, social media, online calendars, postcards, etc.). The Chamber will promote your ribbon cutting in at least one e-mail notification to the Chamber membership. Your ribbon cutting will also be listed on the Chamber website calendar. The Chamber will take pictures and post on the Chamber website. It is recommended that you send a press release out to local media. If the El Dorado Hills Chamber of Commerce is assisting in your celebration we ask that you list us on all promotional materials and advertisements. For more information on Ribbon Cuttings, Open House Celebrations and Grand Opening Celebrations, please call us at (916) 933-1335. Clever invitations help to assure good attendance. The time, place, business name, address, and any special event or activity that you have planned should be mentioned. If food or refreshments will be served, this should also be included in the invitation. If this is the case, you should ask for an RSVP. Invitations may be extended to the general public or may be limited to civic, chamber, governmental leaders, news media, employees, clientele, friends, local business or other groups. Basically, invite anyone you want! Send them well in advance. The success of your event depends upon your ability to be a good promoter, good host and a bit of a showman. The main idea is to attract people to your place of business and then to keep them interested and entertained while there. The Chamber will provide your organization with a ribbon and large ceremonial scissors for the ribbon cutting. You just need to decide who will actually hold the ribbon and do the cutting! 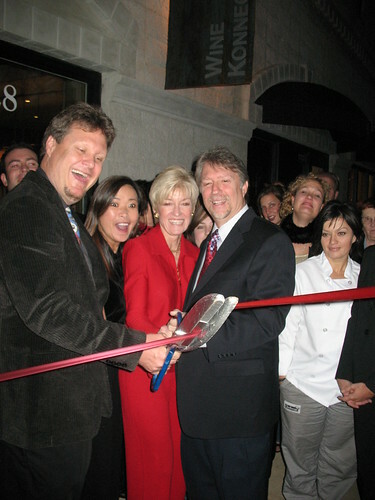 A typical ribbon cutting is approximately 1-2 hours. The Chamber will ask the Chamber Board, our business volunteers, and Ambassadors to be at your event. It’s your event, make it as grand or as simple as you like. It can be as simple as coffee and donuts, cake and soft drinks, or as elaborate as catering with food and music. The Chamber can provide a list of caterers who are members. A ribbon cutting ceremony establishes your relationship with the community, business partners and members of the El Dorado Hills Chamber of Commerce. The El Dorado Hills Chamber of Commerce wishes you well as you begin planning your ribbon cutting event! Helping Business Succeed! Please fill out the form below if hosting a ribbon cutting interests you. Please enter your preferred date or month.